We recently had the chance to review a Flexi-Clip from Lilla Rose. "The Lilla Rose product line centers around unique, functional, and well made hair jewelry. From our flagship Flexi Hair Clip, we have expanded to Hair Sticks, Orings, Hairbands, and Bobby Pins. From there we rounded the line out with complimentary designed Eyeglass Holders, Badge Holders, Necklaces, and Earrings." "Designed to hold everything from fine, thin hair to the longest, thickest locks, the Flexi Clip comes in six different sizes to accommodate everyone from children to adults. Check out the sizing video which was super useful in helping me figure out which one was right for my hair. The site also offers various styling videos and shows how this one clip can work for a pony tail, french twist, tails up, drop bun styles and lots more. What we thought: I love, love, love my Flexi-Clip! In fact, I'm finding it a little hard to share with my lovely daughter. It looks great on us both and we've tried several of the various styles with great success and beautiful results every time! It is so easy to create really gorgeous hairdos in a matter of seconds with this fabulous little tool! The variety of sizes and designs makes this clip work wonderfully for endless hair types and styles! I love that the "pin" is connected to the clip so you don't have to worry about losing it. I almost always wear my hair up, its just easier that way. I often get the dreaded "ponytail headache", but the Flexi-Clip has put an end to that:) And, since the Flexi-Clip can hold back my hair in a variety of ways, my boring, old ponytail is a thing of the past! These clips are an excellent, affordable way to add a little style to your hair:) ABCD Diaries gives the Lilla Rose Flexi-Clip an A+! Buy It: Find these awesome clips at Lilla Rose! 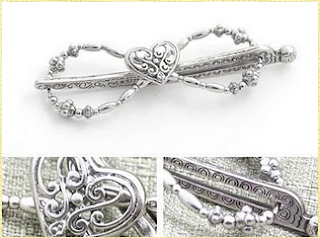 Win It: One ABCD Diaries reader will win a Lilla Rose Flexi-Clip!! To enter, sign up to follow our blog via GFC and comment below. Disclosure: ABCD Diaries was given a Flexi-Clip for review purposes only. We were in no other way compensated. The opinions expressed in this post are ours and ours alone. I entered the Winter Tale giveaway. follow publicly with gfc (pennywatcher). thanks for another great giveaway. I love the celtic knot clip. I entered Swanson Health giveaway. entered San Diego Pretzel Co. I love the medium Soaring Butterfly clip. I entered the Wear Luck giveaway. Also entered the One Princess & One Pea giveaway.